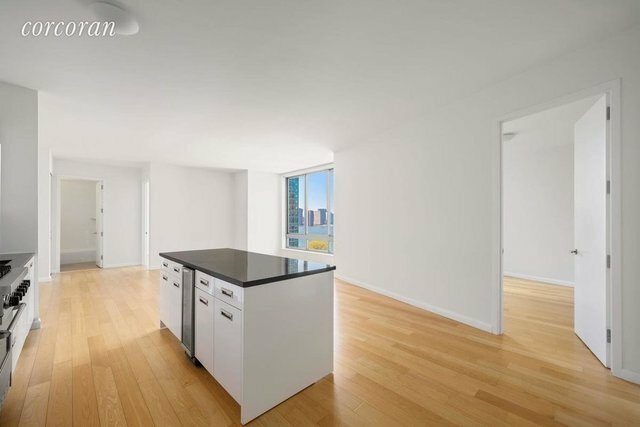 Located at 46-30 Center Boulevard, the coveted View at East Coast Condominiums, this stunning two bedroom apartment boasts unobstructed, picturesque Manhattan skyline views. An entry foyer welcomes residents into the sprawling home, designed as a luxury-infused, modern residence. The spacious living room, perfect for living and entertaining alike, features floor-to-ceiling windows that maximize natural light and provide breathtaking views of the East River, Manhattan skyline and beyond. Enjoy high ceiling height, beautifully crafted hardwood floors, ample closet space, and in-unit washer and vented dryer. Featuring all the luxuries of a modern home, the residence includes an open, gourmet kitchen equipped with best-in-class appliances by Subzero, Viking and Bosch, a wine cooler, white lacquered cabinets and granite countertops. The master bedroom features a large walk-in closet and a spa-like master bath with Italian marble floors, mosaic marble walls, a luxurious glass door shower and top-of-the line fixtures. The second bedroom boasts stunning panoramic views of the river and city skyline. The View at East Coast Condominiums is a highly luxurious residential building, located in Long Island City, designed by the renowned architectural firm Handel Architects. This elegant building offers all the modern conveniences of the Manhattan luxury apartments, but adds even more exclusive benefits. With astonishing views of the East River and Manhattan skyline, one could only dream of this perfection. Residents benefit from a 24-hour doorman, a concierge, bike storage, and a parking garage. The East Coast Club, located on-site, offers a state-of-the-art fitness center, an enormous lap pool, sauna and spa, cinema room, a great outdoor rooftop with barbecue grills and cabanas, and a billiards room. With the city just minutes away, you are surrounded by stylish boutiques, exceptional restaurants, and famous museums and galleries. Come be a part of this picture perfect community just a subway away from your favorite city!